Prepared for a warm, sunny afternoon at the beach on that balmy June day, Leo thought he was garbed perfectly for the occasion in shorts and a t-shirt. By the time we were having lunch however, we both realized we should have brought light jackets with us, so cool was the breeze even with the blazing sun overhead. Welcome to San Diego and its idyllic Mediterranean climate. Recognized as having one of the two best climates in America by the Weather Channel, San Diego experiences pleasant weather all year round, with an average daily temperature of 70ºF or 21º Celsius. 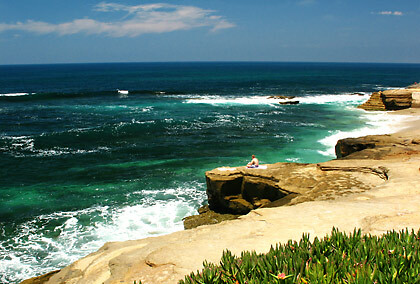 La Jolla has one of the most scenic coastlines not only in San Diego but in southern California. We left the Philippines to live and work in San Diego in 2006, staying there for almost three years. The city might be California’s second largest but San Diego County is spread over 18 cities and numerous charming neighborhoods and is not a crowded metropolis like New York. Situated just next to the Mexican border, San Diego is famous for its many beaches and an array of world-class family attractions such as Sea World, the San Diego Zoo, the San Diego Zoo Safari Park and Legoland. San Diego is also a military town housing many US Navy, Coast Guard and Marine Corps facilities. Stopping by at Seaport Village we never fail to see an aircraft carrier or an attack ship of the US Pacific Fleet inside the harbor. An elderly carrier, the USS Midway, has been converted to a floating museum just off downtown San Diego. A military history enthusiast, Leo just had to visit the Midway on our first year in San Diego; by good fortune our team leader’s wife Wilma Tan happened to have passes for that year. The Maritime Museum is also nearby with its excellent collection of historic ships including the Star of India, the world’s oldest active ship. 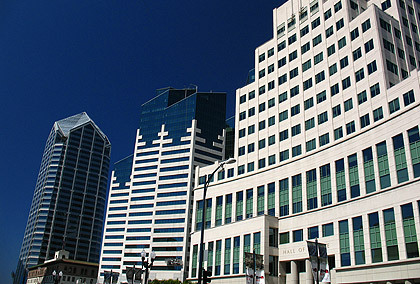 and the San Diego Hall of Justice at right. Just like our six-year stay in Baguio we had the good fortune of living and working in a city with a relaxed atmosphere. Our work took us most of the time to downtown San Diego where the pace of life for us was easier-going compared to that in Metro Manila. 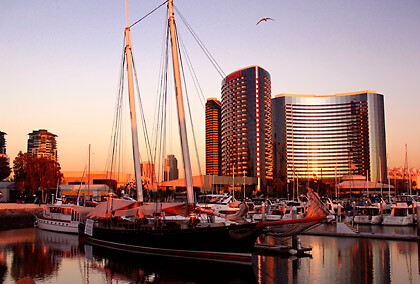 With the downtown area right by San Diego Bay, it was a no-brainer deciding where to unwind after a day’s work. Our first option after a hectic day was to head to Seaport Village and the Embarcadero Marina Park and spend a couple of hours relaxing by the sea over a cup of coffee and enjoying a free outdoor concert. 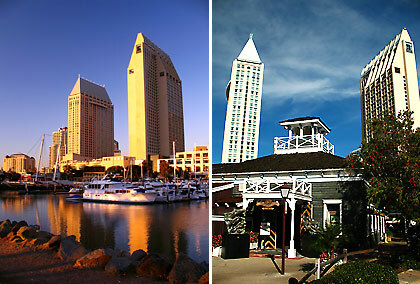 Right: Seaport Village has a collection of unique boutiques and restaurants by the sea. 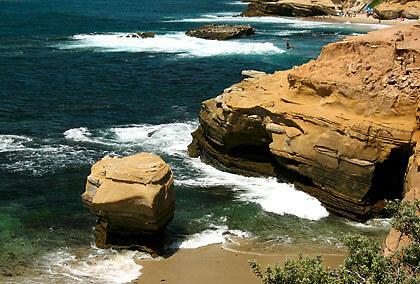 San Diego’s coastline is dotted with numerous attractions. La Jolla’s rugged coastline and spectacular views helped turned it into one of the most pricey real estates in the country. La Jolla Cove is one of the most photographed coastal settings in California and can fill up with swimmers, surfers and divers in the summer. Swimmers and beach bummers also crowd the beaches of La Jolla Shores. At the Children’s Pool, however, the main residents are California gray seals. Down the coast it is possible to observe California gray whales from December to March – the time of their migration from Alaska to Mexico. South of La Jolla are the coastal communities of Pacific Beach and Ocean Beach. 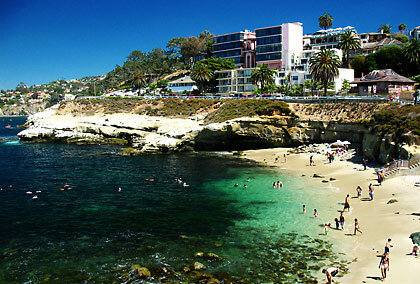 La Jolla Cove is a favorite of photographers and swimmers. The Children’s Pool at La Jolla. California gray seals have made this their home. Point Loma is another favorite hangout of ours. It’s not too far from downtown San Diego and Leo often does work on his lap top in between appointments at the coffee shops there. 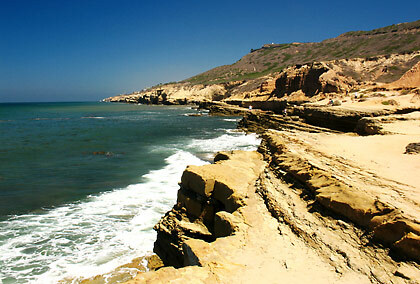 Point Loma is the site of explorer Juan Cabrillo’s landing in 1542 when he claimed the land for Spain. This would eventually lead to the founding of California which then became a part of Mexico and eventually the U.S. 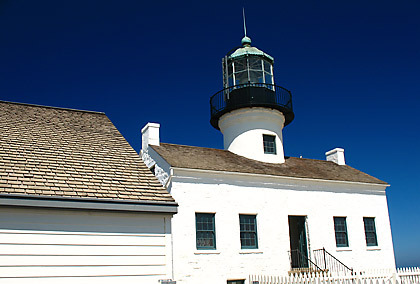 The Cabrillo National Monument, a statue commemorating the explorer’s landing and the 150-year old Point Loma Lighthouse are the two main historical sites here. But the best reason for going to Point Loma is the spectacular 360 view at its tip where one can observe San Diego Bay, San Diego Harbor, the downtown San Diego skyline, Coronado Island and even Tijuana, Mexico in the distance. Migrating gray whales may also be observed during the winter months here. The rugged coastline near the Cabrillo National Monument. One can also travel back in time and relive San Diego’s frontier days at Mission Valley. The valley is the gateway to the eastern communities of El Cajon and La Mesa and home to major shopping centers, a long cluster of hotels and restaurants (Hotel Circle), Qualcomm Stadium – home of the San Diego Chargers – and Old Town State Historical Park. The latter is a collection of 19th century ranch homes and shops that gives the visitor a look into life here during that period. 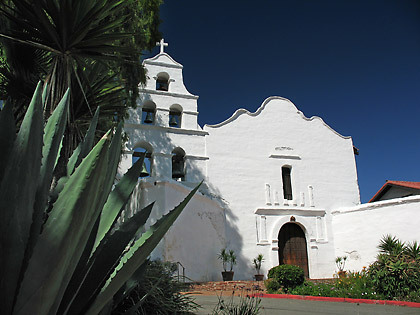 The Mission Basilica San Diego de Alcalá – the site where the first of the Spanish California missions was relocated - may also be found in the valley. The first mission, established by Father Junipero Serra in 1769 was actually at Presidio Park overlooking Old Town, also in Mission Valley. 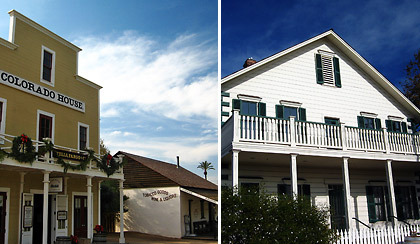 Restored 19th century homes and shops at Old Town State Historical Park in Mission Valley. Also located in Mission Valley, the Mission Basilica San Diego de Alcalá has an excellent exhibit of San Diego’s early history. Although known more for its beaches and climate, San Diego we found out is also a haven for arts and culture. 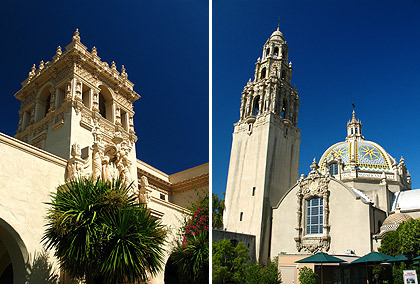 There are 30 museums in the city with half of them in Balboa Park along with 9 theaters and centers for performing arts, making it the city’s center for culture. 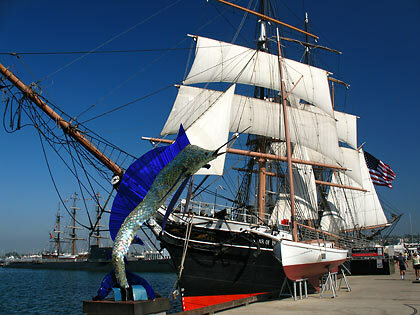 The park is home to the San Diego Natural History Museum, the Timken Museum of Art and the Air & Space Museum. 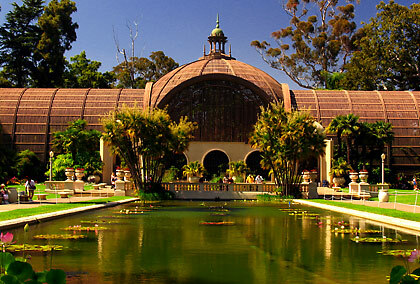 The San Diego Zoo is also located inside Balboa Park. The lily pond reflecting pool and the Naval Hospital at Balboa Park. The Botanical Building with reflecting pool in the foreground, Balboa Park. 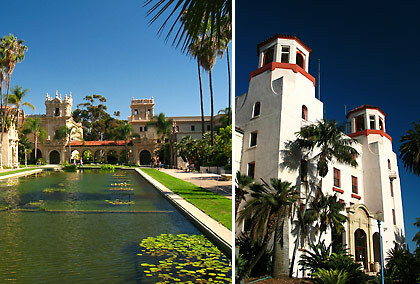 Casa del Prado and the Museum of Man: Balboa Park is San Diego’s cultural heart. Connected to San Diego City by a beautiful long-span bridge across San Diego Bay, Coronado is an upscale city of elegant gardens and mansions. The long beach where historic Hotel Del Coronado is located is also one of the most famous beach fronts in California. The picturesque former gold mining town of Julian, located near the eastern extremity of San Diego County, is famous for its apple pies. It’s also one of the few places in San Diego where it snows although the winter days in Julian are sunny and cool and characterized by light snowfall. From vantage points in Julian it is possible to observe the Anza Borrego State Park, California’s largest state park with about 600,000 acres of untouched desert wilderness teaming with wildlife. We haven’t been to Anza Borrego ourselves (only observing it from afar at Julian) but friends say the best time to visit is in spring when the park explodes in a colorful display of desert wildflowers in bloom. 1. Eating banh mi or Vietnamese sandwich in Clairemont and pho hoa (Vietnamese noodle soup) in Mira Mesa – small bucks for big, delicious food. 2. Eating authentic Mexican cuisine with our good friend and Mexican food aficionado, Fel Yturralde; Fel is convinced that that the best Mexican food may be found in the rustic stalls and restaurants of south San Diego. 3. Strolling down the Embarcadero and Seaport Village and enjoying the sea breeze. 4. Browsing through books at Borders in Mission Valley and Gaslamp (unfortunately the store at Gaslamp has closed down). 5. Eating at Sarku in Horton Plaza, especially when our favorite Chinese or Japanese cook is the one generously serving the chicken barbecue. 6. Enjoying an evening at Shelter Island and watching the city skyline from a distance. 7. Playing badminton at Balboa Park and strolling around the place. 8. Watching the Padres at Petco Park. We’ve noticed that it’s not just the game people watch (baseball is essentially a “slow” game”). It seems that people take advantage of the time between players' turns at bat or between innings to socialize with each other. 9. Shopping for cheap clothes at Ross or the outlet shops near the Mexican border. 10. Picnicking with friends at San Diego’s many public parks. 11. Singing our hearts out on Magic Sing at friends’ homes and sneaking out before their neighbors have a chance to see who we are. 12. Watching a live Manny Pacquiao fight with friends at Greg and Heny Alberto’s place and trying to enjoy a good meal while the blood and guts are spilling out in vivid colors on HD TV. 14. (Leo) Going on a food trip with the guys in our small group at various dining places in San Diego and watching a friend miraculously turn his Vietnamese DIY spring rolls into Mexican fish burritos. 15. (Nina and June Lao) Cooking for backpackers and young travelers at Hostelling International in the Gaslamp district and amazing them with cheap but excellent quality Filipino food (lumpia – or is it loompia? - beef caldereta and pansit to name a few). 16. Malling at Chula Vista. 17. (Leo) Going to appointments in Orange County, LA or Temecula with Fel and Gin Lao while trying to enjoy the drive – and trying not to doze off while driving. 18. Prayer walking in downtown San Diego, especially during the winter months. 19. Touring San Diego by trolley on a day pass. If you’re from LA and hate the traffic going down Interstate 405 (reputed to have one of the worst, if not the worst, traffic in the country) this is probably the best way to tour San Diego. But what we miss most about San Diego are our friends. More than the place, the experiences we shared with the people of San Diego and any place for that matter will stick in our collective memories for a long time. Our warmest appreciation to friends who made our stay in San Diego such a pleasant one. This page is dedicated to you.